In early December, the Mountain Man and I road tripped to the Charlotte Gun Show. Neither of us had ever been to the Charlotte show, so it was as much to see who the vendors were and what they had for sale as it was for buying. Two buildings, lots of vendors, and surprisingly little jewelry, beef jerky or other non-gun stuff. Three vendors stand out in my mind. The first was a leather vendor. Now this gentleman and his daughter were not the usual leather vendors that you find at a gun show--not a holster in sight. As a matter of fact, they made belts, and only belts. But what belts they made! I bought two. They're made to order from a longish list of leather blanks he has in stock. Customizations such as buckles and conchos to taste. 1 1/4" and 1 1/2" widths, extra thick 100% leather. Not works of art, but man, what belts! I have his contact information somewhere in one of the multitudinous piles that dot my desk, and when I find it I'm going to order one or two more. It doesn't hurt that his prices are less expensive that the big name brands sold at your local mall, and with immeasurably better quality. The other two vendors are more problematic in my mind. Both of them were older gentlemen--nice fellows, a pleasure to talk to. Both had been buying guns for many years, and both had extensive collections that they had on display on their tables. They were both selling off their collections. I've seen this before, and I don't like it. I always wonder why they're selling a collection they've devoted their lives to building. Do they need the money or do they feel too old to enjoy it any longer? Don't they have anyone to pass it on to? I've asked, and usually the answer doesn't feel quite right. "Well, my wife says I have too many, so I thought I'd sell some." It doesn't rank up there with the guys that come to every show with their father's or their grandfather's guns to sell. Those guys just make me mad. Don't they have any sense of family history at all? For crying out loud, I have one of my great-grandfather's guns in my safe, and it is not, will not, EVER be for sale. I have my grandfather's shotgun and my fathers shotgun, and that goes for them as well. At any rate, one of these gents did give me the closest thing to an answer I could be comfortable with I've ever heard. A year or so ago, he injured his back, and isn't able to shoot much any more. The story didn't go any further, so I don't know the whole story, but I think I see a possible story. Medical bills, kids who dodn't care about their father's passion for firearms, and well, you wind up with two tables at the Charlotte Gun Show, selling off your guns. While the Mountain Man dickered a bit with him over some ammunition, I looked over what he had left. Being Sunday, he had sold most of the obviously good stuff. However, I'm proving to be a sucker for "project guns", and I'm a double sucker for .22 rifles, especially the older ones with nice long barrels. One gun, old, a bit worn and pretty dirty, caught my eye. Giving it a look, it was a semi-auto, long-barreled .22, short, long and long rifle. No serial number, so it had to be pre '68 GCA *spit*. A Savage Model 6D--D for Deluxe. No price on it. I had went to Charlotte with limited funds, mostly looking for components for this winter's First Reload-A-Thon. The Reload-A-Thon is what I hope will be an annual event, in which a number of us get together and reload ammo by the hundreds if not thousands of rounds. My funds were pretty much depleted--I knew I had $46 in my pocket. "How much for the old Savage?" Obviously, he has me pegged. "$100," is the reply. Even I know this is way over what the gun is worth, especially in this condition. "Well, it's a nice gun, but I don't have that kind of money left. Thanks anyway." I told him that I really didn't have even his reduced price on me. The Mountain Man finished his transaction, and we headed out to the car to deposit our goodies. I had to venture back in, as I had the previously mentioned leatherman making me two belts, and I had to pick them up. I also happened onto a vendor I had missed, and scored 2000 9mm bullets for less than I could order them for. There went the last of my cash. No problem--I was headed for home. On the way out, I went back by the table with the Savage. The older gentleman was beginning to pack up--it was 4, and the show was drawing to a close. "Hey, you interested in that gun?" he called as I walked by. I held up the ammo can containing the 9mm bullets (more accurately, I wiggled it in my numb fingers and nodded in it's general direction) and told him I'd just spent the last of my cash. I told him that I hadn't brought my checkbook, just so I couldn't be tempted. "You can mail it to me." "You mean you're going to give me this gun and trust me to mail you a check?" I'm about half-past incredulous and heading toward complete disbelief. "I've always thought I was a good judge of character. Besides, I'll copy down the information off your driver's license." So we traded information, and the Savage 6D (D for Damn, I don't believe this!) and all those bullets managed to drag our way to the car. I related this to the Mountain Man, who's answer was "Well, you are trustworthy." Well, maybe so, but how is this guy to know? Even a month later, I'm still a bit stunned by the whole thing. With a stop at the Concord Outlet Mall (Yeah, right!) for supper and a visit to Bass Pro, I made it home later that evening. I showed the latest acquisition to the jaundiced eye of Mrs. Freeholder and the gleaming eyes of the kiddies, then put it in the safe for later examination. The next day, a check for $75 made it's way into the US Mail. Yeah, I guess I am trustworthy. It was near Christmas before I had time to have a serious look at the gun. After striking out on a manual, I decided that I had seen enough guns to make a go at this sans instructions. Unscrewing the single screw that holds the action to the stock, I found that the hidden metal was in much better shape than the exposed portion. The stock itself was in pretty good shape, although the finish was pretty much shot. I took the buttplate off, and found a bit of deterioration in one screw hole--someone had the bad habit of letting the gun sit on wet ground. Easy enough to fix. I put 2 cans of Brakleen through the action and the bore. Crud came out in chunks. I was seeing the history of .22 ammunition, laid out in paste form. Gross. I locked the action open (the Savage has an unusual moving cocking handle that is used to lock the action closed so that short and long .22 can be fired single shot, and lock the action open for whatever reason you'd want to do so) and started on the bore. I ruined a brass brush on that bore. What came out looked like a lead and powder residue cocktail. But after a while, you could tell the bore was actually in good shape--shiny (well, sort of), not pitted and nice, distinct rifling. OK. Luck is with me. 0000 steel wool and oil got the worst of the rust, but I needed to get the bolt out to really clean the inside. There was a large, threaded plug in the end of the action, and that had to be how this thing comes apart. Well, not for me--it screwed part way out, then stopped solid. Not wanting to damage the gun, I sought help in a number of online forums. Not one was able to give me the magic incantation to get the plug out. New Year's Eve, we had Old Friend, Old Friend's Older Brother and their respective families over to The Freehold for a cookout and a late exchange of Christmas gifts. OF and OFOB being gun-oriented, we had to adjourn to my shop and look at the latest project. OFOB being a mechanic by trade, his knowledge and intuition led him to wrap the plug in a rag and carefully take a pair of my channel locks to it. Luckily, I'd went inside to fetch food for the grill, and by the time I got back the deed was done and the gun taken apart. Neither one would believe that I had shot two cans of brake cleaner through the action--you could still scrape gunk off the bolt. Food being on the grill, we had to end our efforts there. We left the gun on the bench, in pieces. A few days later, I was able to work on it some more. Two more cans of brake cleaner, a razor blade, another .22 bore brush, 2 oz. of Hoppes #9, a 12 ga. shotgun brush, a brass toothbrush, some Eezox, a lot of rags and some skinned knuckles later, the gun was clean enough I'd consider trying to shoot it. This weekend, Daughter, Son and I loaded the Savage, along with a couple of other toys and a lot of ammo, and headed to the range. Loading the Savage with 5 rounds (no sense tempting Fate), I cocked it. I took a supported standing position and aimed at a steel plate 50 yards away. BANG...ping! OK, it goes bang--this is an encouraging sign. I finished the short magazine at the plate, hitting it each time. I take this as evidence the barrel is in decent shape. Loading the full 15 rounds, I tried a rested position at an 8" target at 50 yards. Everything is on the target, but not much of a group. OK, so maybe the barrel isn't in that good of shape. So I tried 100 yards, and got 3 of 15 on the very bottom of the paper. Further experimentation showed a holdover of a foot for the 100 yard target. On at 50 yards, a foot off at 100? WTF? Is the barrel that bad? I kept trying, and found that the sight picture is a bit...odd. The rear sight is actually subtly rounded off, rather than the flat sight I'm used to. Figuring that out helped some. As it was getting time to go, I decided to run some plated rounds through to help remove any leading. For a hoot, I tried the 100 yard plates again. Ping, ping, ping--13 of 15. The gun is ammo sensitive--the first long .22 I've seen with that issue. That's Good News. Shooting the old Savage is an experience. The bolt action is delayed. Squeeze the trigger, BANG, then you can feel the bolt go back to battery after a distinct pause. Watching Son shooting, the bolt holds open long enough that you can actually see the next round waiting to be chambered. Very unusual. The old guy needs more cleaning, and the stock needs refinishing. However, I think it's found a home--and I won't take it to a gun show when I can't shoot it any more. I've raised my kids to respect and love guns and shooting. It'll go to one of them when my time is through. Thanks for the story. I have one in my safe that was handed down and I'm beginning my venture to clean it up. Thanks for the tips. Thanks for the story. I have one that my father bought many years ago. It was used but in good condtition. I learned to shoot with that rifle. When I get it out to look at it or go to the range with it nowadays, I always remember my dad teaching me to shoot in the national forest with that rifle. A pleasant memory now that he is gone. The bolt action is not "delayed", the bolt stays open as long as you are squeezing the trigger. Let the trigger go, the bolt closes. I got one a few years ago at an estate sale. It was in pretty bad shape, but after a few hours of cleaning and some TLC it's now one of my favorite .22's. Wow that's an amazing story of a true life event. My dad gave me a marlin 60 when I was 8 yrs old and today I can still remember all the times we spent together learning about the safety of guns and the target practiceing and hunting. But after my dad past when I was 18 my uncle took everything thats my dad gave me. But not the memorues . 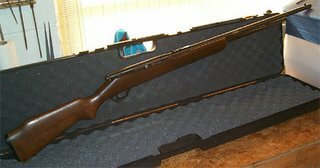 But I was in luck today I was told by afriend thats he had a savage 22 for sale same as yours but semi auto with a colt master jr scope and its a pre 1968 model d for a hundred bucks I was like hell ya I'll take I paid him 50 cash and a complete original xbox system loaded with games and accesories . Its used but in great shape for normal wear and tear . But needs to be torn down cleaned and reblued and the stock needs to be lightly sanded and refinished but its a well taken of rifle and besides its a true pre 1968 savage made by arthur savage . But it truely brings back childhood memories. I love it and hope my kids will to one day. I have a Savage 6A, probably pre-World War II vintage, that belonged to my dad, and I love it. A very reliable and accurate weapon that is fun to shoot. I'm 60 years old now, and unfortunately my dad passed away 10 years ago. This is the weapon that I originally learned firearms safety on from my dad, and I still enjoy taking it to the range and hearing the unusual click-clack of the action. I have a beautiful old Savage 6A that belonged to my dad. It is probably pre-WWII vintage. He taught me gun safety on this weapon. I still enjoy taking it to the range and hearing the unusual click-clack sound of the action. It's a reliable and accurate rifle that I will never part with. I'm 60 years old now and dad passed away over 10 years ago. Firing this great example of American engineering always makes me think of him.